The EDGE format is designed to import logger data into the EDGE Field Results, EQuIS Live, or the appropriately-named logger sections which are linked in the Data Loggers article. Note: The Live Logger and Field Logger sections have headers (displayed as EDGE tabs) separate from the data, in all other sections the headers are with the data. In the sections separate from the data, it allows the user to upload logger data from multiple devices into one EDD. The EDGE format is set up to import loggers into either Live Logger Section, Field Logger Section or the appropriately named section depending on the device. Note: Ensure that the Live sections of the EDGE EDD format are enabled by following the instructions in Turn On/Off Live Sections in Format. 3.Open the EDD exported from EDGE containing the logger data; In this example, The LIVE_LOGGER_DATA section and the Live_Logger_Data_Header section will be populated. A separate column will be created for each field defined in the import file. The following steps apply to field logger data as well. 4.Warnings will be provided if the units and SYS_LOC_CODE associated with the data are not present in the EDD or the database. These warnings can be resolved by adding the relevant information to the EDD or relevant table in EQuIS Professional, and reloading EDP. 5.Check for errors and select Create. 6.The data will populate the following tables. •SERIES_UNIT is populated based on the header row for each data series. 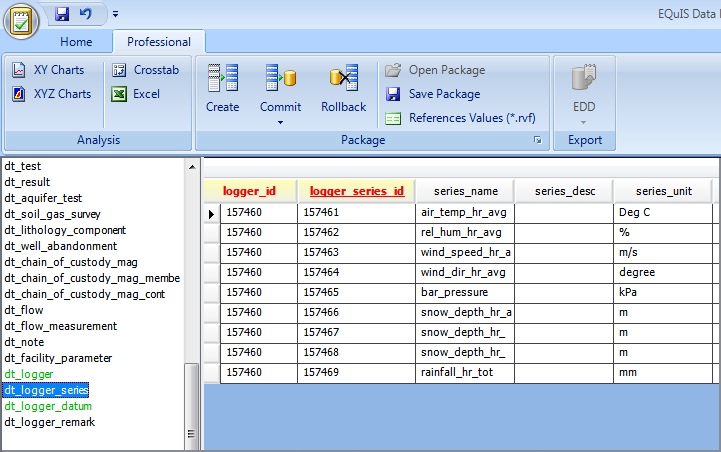 •DT_LOGGER_DATUM - numeric logger data for each series. 7.Commit the data to the database.